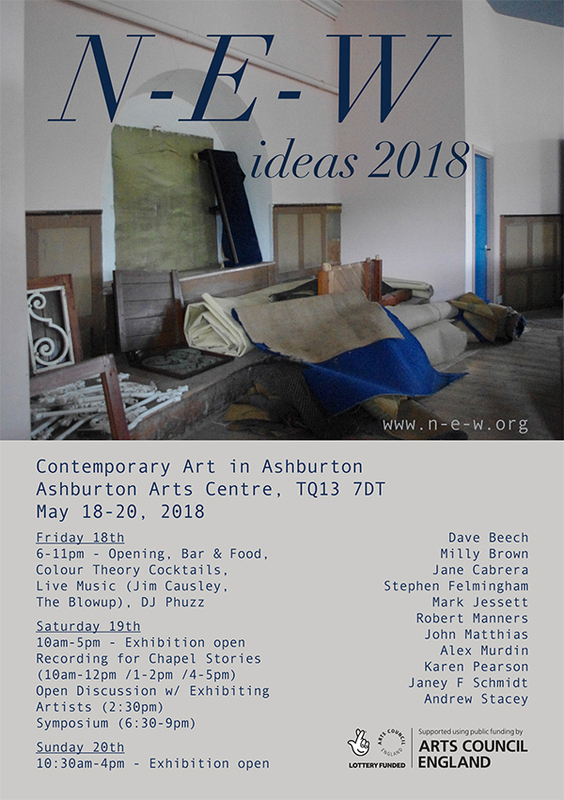 The recent purchase of the Methodist Chapel in Ashburton by the community has presented a wonderful opportunity for us to stage our third contemporary arts event in partnership with Ashburton Arts Centre. 10 contemporary artists, who all live in Ashburton, have come together to make new work that responds in different ways to the Methodist Chapel. All the work is site specific. Some will take the form of installed artworks and some are planned as the start of ongoing projects that ask the community for their involvement so if you want to particpate check out – SYMPOSIUM – CHAPEL STORIES – 5th PLINTH. An abstract, painted wall work occupying the western stairwell of the Methodist Chapel specifically made to reflect the unusual architectural properties of the space and to acknowledge the changing use of the building. A site specific work using images of discarded tin drink cans – referencing Ashburton’s historical past as a Stannary town and reflecting on ideas about branding, capitalism and globalism in an old site of worship. A response to how the internal spaces of the new Arts Centre are inhabited over the weekend – over the course of the weekend she will be building a large physical and visual map of movement of visitors to ‘N-E-W Ideas ’. The work will grow over the weekend into a finished piece that will give a snapshot of who came, how they engaged with the building and the event and a breakdown of age data by colour. to represent women’s contribution to politics and change. A large kinetic mobile suspended across the main chapel space containing written prayers that ‘float’ in the building representing a mass of accumulative prayers that have been ‘released’ within the walls of this chapel over time. Dave Beech is an artist and writer. He is Professor of Art at Valand Academy at the University of Gothenburg and Senior Lecturer in Fine Art at Chelsea College of Art, London. He is the author of Art and Value (Brill 2015) and is currently writing Art and Labour (Brill forthcoming) and Art and Postcapitalism (Pluto, 2019). A site-specific installation that collapses the past into the present and the future. The chapel’s interior architecture, spaces and non-spaces will be used to determine forms that will sparingly populate the upper gallery of the building.The forms will be ‘seated’ on pews and will be loosely suggestive of congregation members in scale and posture. These figures will be transient and evanescent; uncertain in their boundaries, obscure in their detail, hesitant in their presence. In 2013-14, artist Simon Pope convened a series of workshops on Dartmoor with renowned Devonshire singer/songwriters Jim Causley and Bill Murray. They were joined by a variety of people with an interest in Dartmoor’s tinworking heritage, and in thinking ecologically, to write “a song to the tin.” The result – Pride of the Moor – has been sung at Spacex gallery in Exeter, St. John’s College in Oxford, and at the Dartmoor Folk Festival and now for the first time in the Stannary town of Ashburton.